TWICE's first solo concert has sold out quickly, not even an hour went by until you couldn't find the tickets. The group debuted two years ago and shot to fame with tracks such as "Like Ooh Ahh," "Cheer Up," and "TT". TWICE has won several awards and also broken several YouTube records. 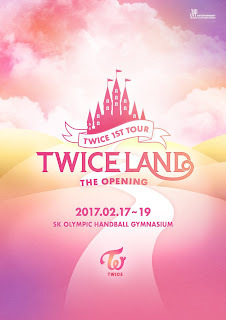 The first solo concert, "TWICE 1ST TOUR 'TWICELAND -The Opening-'", sold out within 40 minutes on January 20th. The solo concert will last for three-days and all seats were taken, included standing places and designated areas. As for when the concerts will be held, it's at the SK Olympic Park Handball Gymnasium in Seoul from February 17th to the 19th.